"TRAVIS I AM NEVER READING YOUR ARTICLES AGAIN HOW DARE YOU RECCOMMEND THIS ITEM!!1!" 2. Think about things before using caps lock. Have you calmed down a bit? Good. Let's take a look at some instances when an item that halves your speed can be useful. You're probably familiar with the move "Trick." It switches whatever item you have with your opponent's. Put on a Macho Brace and your opponent's sweeper is crippled. In the metagame, where speed means the difference between sweeping an entire team to being KO'd without dealing any damage, this can make the Macho Brace/Tick combo a devastating blow for a sweeper. 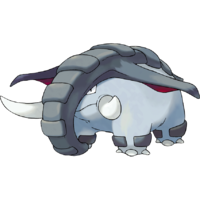 Part 2: Gyro Ball, Or: Donphan? I'm a DonFAN! Part 3: Trick Room, Or: When has a room ever made a slow person fast? I still don't get that move name. This one is pretty self-explanitory. You have a slow Pokémon because of Macho Brace. You use Trick Room. Now you are faster than everything else. Boom. And we're out. Later, Poképeople.